I’ve had a lot of time to think during my trip out of town for a family emergency (it’s going to have a happy ending, but does mean all recycled photos today) and I spent some of it thinking about what insects-and-water-quality post I should do next. I had several ideas about what I might write about. Perhaps I should talk about diversity and water quality or the metrics and bioassessment tools that are used by state and federal water quality managers. Suddenly it occurred to me that I haven’t ever discussed one of the most important topics! I’ve never explained WHY insects are such great indicators of water quality and why using them in this manner is so popular with researchers and water quality managers. Today I’m going to do just that! Really should have done this post ages ago, but sometimes inspiration doesn’t hit at convenient times. 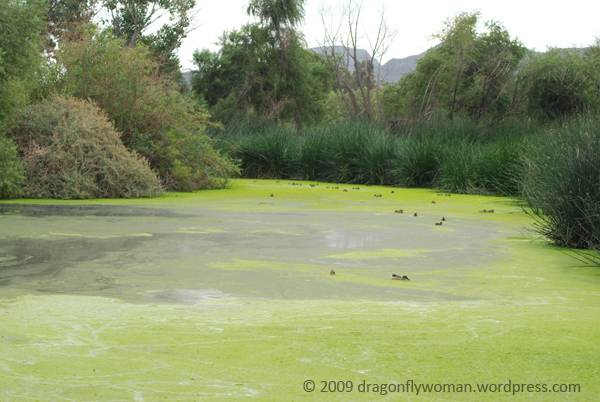 There are several reasons why using insects as bioindicators of water quality is so popular. One of the most important is that aquatic macroinvertebrates are found in nearly every body of inland (non-marine) water, so they are ubiquitous. A little puddle of water in a rock the desert? Yep, there are bugs in there. A huge river in the Amazon? Lots of bugs there! A stream with a pH of 2 (highly acidic for those of you unfamiliar with the pH scale)? 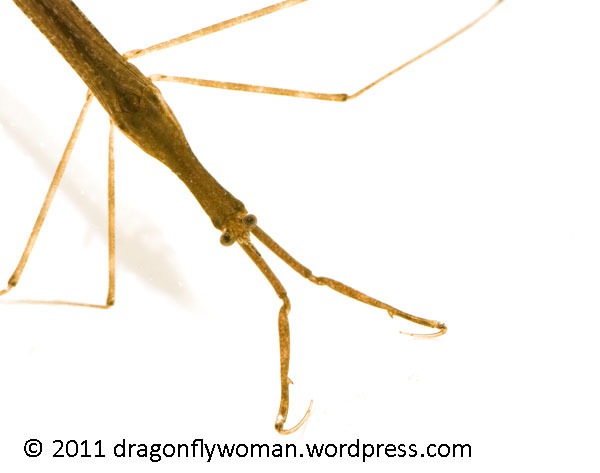 Even there – and I’ll talk about the insects I found in just such a stream in a future post. There are insects that can live in pools of petroleum, hot springs that would boil a human alive, and water that’s hundreds or thousands of times saltier than the ocean. All in all, there are very few biological organisms that you can find in so many different aquatic habitats. As a result, insects and other macroinvertebrates are the darlings of water quality researchers while many other aquatic plants and animals are completely ignored. Macroinvertebrates are also useful as indicators because they are abundant. If there are insects in a body of water, there are usually lots of insects in that body of water, even in highly polluted water. This means that you can get a decent sample without severely impacting their populations in most places. This isn’t always the case with some of the bigger animals like fish. Sometimes you need a tissue sample to see how water quality is impacting aquatic wildlife, such as an analysis of the amount of lead being absorbed by the wildlife in a stream. You often need fairly large tissue samples to run these sorts of tests, so the bigger the animal the better. Fish are perfect, but they’re not found in every body of water. Microorganisms such as algae, bacteria, and protozoans abound in many types of water, but they’re very small. If you need even a small tissue sample the size of, say, a bloodworm, imagine how many bacteria you need to collect from the water to create a big enough sample! Not only are insects abundant and ubiquitous, but they’re a lot bigger than most other abundant and ubiquitous organisms. This makes them more useful as indicators. Insects are easy to collect compared to a lot of other things too. Consider how difficult it is to sample fish! You can use a rod and reel and spend days collecting 10 or 12 fish, carry a massively heavy electroshocking unit with its associated risk of electrocution if something goes wrong, or poison all the fish in an area with a chemical like rotenone (which can also kill insects and amphibians). You could always just sample the water directly, but the last thing you want to do in a remote location is carry gallons of water to your vehicle. Insect samples are easy! One aquatic insect net and a decent sized bottle containing alcohol is enough to collect the sample and get it back to the car. Lightweight, portable sampling equipment is preferable to heavy gear, particularly if you have to hump it into remote locations on foot, and sampling insects is one of the lightest choices. Water quality analyses of any sort are very expensive. While it might seem like the easiest way to determine whether a body of water is polluted, analyzing the water itself is particularly spendy. There are so many man-made and naturally occurring compounds that could be in water that you can run hundreds of tests on a single sample looking for every possible pollutant. Even running a very simple set of analyses looking at nitrogen, phosphorous, and carbon compounds, biological oxygen demand, and a few other parameters can cost nearly $1000. Insect samples are also expensive to process and analyze, but they’re not as expensive as water analysis, maybe $300 per sample as opposed to $500-$1000 or more. For any given budget, you can collect more insect samples than you can water samples, so insect sampling is often preferred. Finally, one of the things that makes aquatic insects and other macroinvertebrates such great indicators is that they live in the water all the time and are reasonably long-lived. Pollution can and sometimes does occur steadily over time (imagine a wastewater treatment plant outfall or a paper mill dumping waste into a river), but a single event can cause massive problems in a body of water. Sometimes, every trace of the pollutant has disappeared from the water by the time a researcher can collect a water sample from the stream. However, many of the insects were in the stream during the pollution event! This means that, even if you can no longer find the pollutant in the water, or never even knew a pollution event occurred, the organisms in the stream can show you that something is wrong. You might not be able to figure out exactly what caused the problem, but you can at least see that there was a problem and start looking for possible sources. 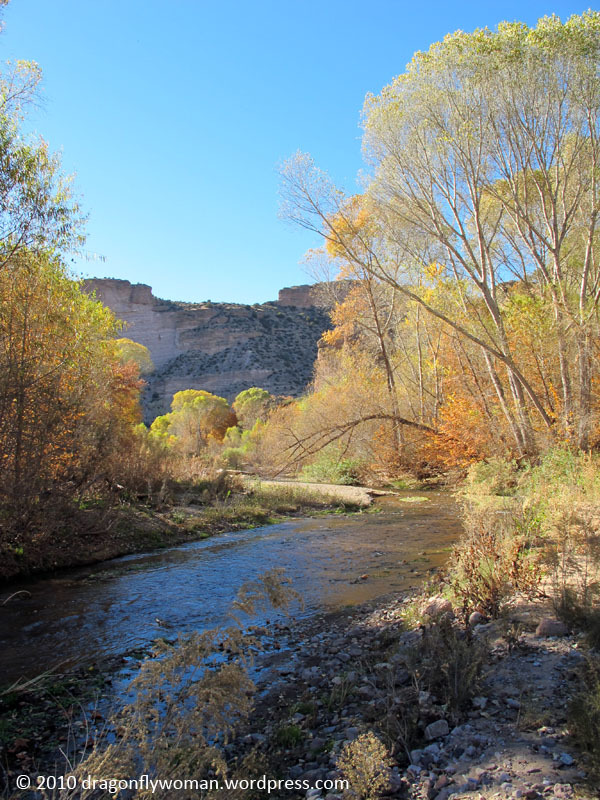 About 6 months ago, I wrote a post about aquatic insects and water quality that highlighted the differences in the diversity of species in a polluted river compared to a clean mountain stream in Arizona. Considering how much I enjoy this subject, it’s been far too long since I wrote about it! It’s time to do something about this sorry state of affairs. My next few Monday posts are thus going to be about how insects are used as indicators of water quality in streams and lakes. Aquatic insects are very useful for making environmental policy decisions and in deciding when managers need to step in and actively manage a body of water. I think it’s useful to know how this works! But first I should introduce the concept of macroinvertebrates. If you ever delve into the insects-as-indicators-of-water-quality literature, you’ll see this term over and over again. Although I tend to talk about insects more than the other invertebrates in streams and lakes, not all invertebrates that live in freshwater habitats are insects. There are lots of other inverts, including crustaceans (crayfish, shrimp, and their relatives), aquatic worms (earthworms, tube worms, leeches, etc), flatworms, mites, snails, and clams. The inverts are divided into the microinvertebrates and the macroinvertebrates. Essentially, anything that you can see with the naked eye is a macroinvertebrate. Everything else is a microinvertebrate. I personally don’t find this definition very satisfying because one person’s macroinvertebrate might be another person’s microinvertebrate (e.g. my macroinvertebrate is very small). Any one person’s cutoff for what makes a macroinvertebrate can change over time and as they gain experience too. Still, water resource managers love the term macroinvertebrate and everyone uses it, including me. An example of water full of organic pollution. This is a constructed wetland intended to clean up water coming out of a wastewater treatment plant before being released into the river. In my first post on using aquatic insects as indicators of water quality, I focused on the changes in diversity that you see along the clean to polluted water continuum and I’ll talk about it again in a future post. The number of species of macroinvertebrates in a stream is a quick and dirty way to compare bodies of water and determine the relative amount of pollution or impairment because clean streams and lakes tends to have more species in them than highly polluted bodies of water. It isn’t precise though. A fairly dirty stream can have almost as many macroinvertebrate species in it as a clean stream under the right conditions. In this situation, it becomes important to consider the specific species that are found in a body of water. This is where tolerance values come in handy. Considering how often tolerance values are used in aquatic research and how valuable they are to water resource agencies and managers, I think it is worthwhile to know where tolerance values come from. It takes a lot of time and effort, and often a lot of money, to calculate tolerance values for macroinvertebrates, but the concept is very simple. First, someone (often a water manager for a state’s environmental protection department or a scientist) will take measurements of pollution or other impairments in many different bodies of water. These could be simple physico-chemical measurements (such as pH, dissolved oxygen, temperature), measurements of embeddedness (how far down into the silt/sand the rocks and pebbles are buried) or periphyton (the algae growing on the surfaces of rocks, soil, and plants in the water), or full water chemistry analysis. Which measurements are taken will depend on the region, the group doing the work, the funding, and the time available to put toward the project. After measurements are made, bodies of water are grouped according to the level of pollution/impairment they exhibit, such as pristine, impaired, and polluted. Next, the researchers send out a hoard of samplers to pull out every invert they can find from as many bodies of water as possible. Some poor group of technicians then “picks” the samples (separates the inverts from the massive amount of junk that you get in aquatic samples such as leaves, sand, silt, twigs, trash, etc) and passes the inverts off to the identification guru to identify. After all the water measurements and invert ID work is done, then the researchers compare the species present in each water body to its pollution classification and use statistics and other mathematical tools to look for overall trends. Inverts that are found only in pristine lakes and streams and never in impaired or polluted waters have narrow pollution tolerances and are assigned low pollution tolerance values, usually 3 or less. Inverts found in impaired and pristine waters but not highly polluted waters have a wider tolerance for pollution. These inverts prefer clean water, but they can tolerate some pollution in their habitats and are usually assigned mid-range values around 5 or 6. Things commonly found in highly polluted waters get high scores, between 8 and 10, though they are sometimes found in clean water systems too. And those things with scores of 11? Well, they can live in some of the filthiest water you can imagine! I don’t know about you, but I can imagine (and have worked in) some pretty nasty water, and there are insects living in nearly all of them. It is important to note that macroinvertebrate pollution tolerance values vary from region to region. Here in Arizona, we can’t use the pollution tolerance values calculated for inverts on the east coast, even when the species are the same, because our waters and the inverts living in them behave differently than those on the coast. Thus, every region develops their own pollution tolerance values. When I’ve done water quality studies using insects as indicators of pollution/impairment in the past, I’ve used a list of tolerance values developed within Arizona that was given to me by the Arizona Department of Environmental Quality. The tolerance values therefore accurately reflect how inverts in Arizona react to pollution/impairment that occur in Arizona. The list doesn’t have every species, but you can often use what you know about which waters you find them in and published records of their presence to fill in the gaps. A normally clean, but impaired, stream a few weeks after the end of a major fire. Photo by Dave Walker. 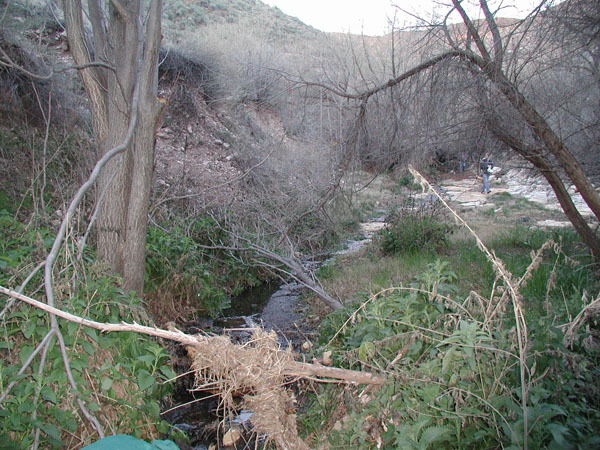 Next Monday I will go through an example of how scientists and water managers use tolerance values by discussing a project I was involved in a few years ago looking at the insects in Arizona’s effluent dominated streams. Tolerance values played a huge role in the analysis of our results, and it was an interesting (but disgusting) project. Until then, have a great week – and don’t forget to enter my latest contest! 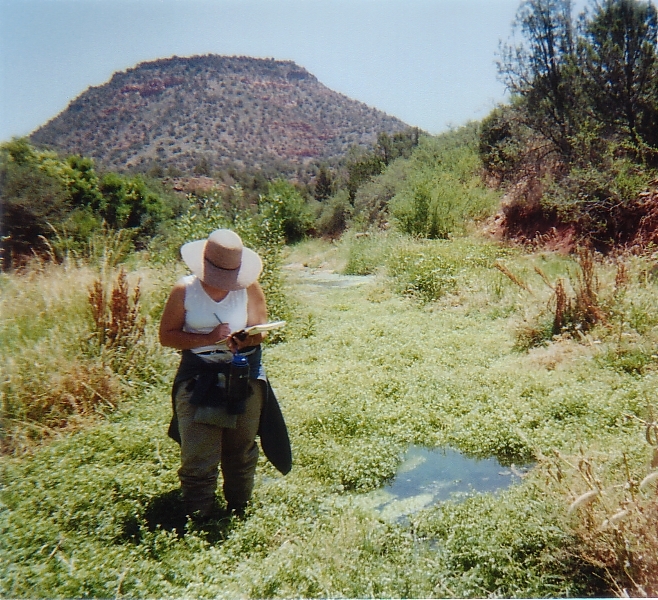 The Dragonfly Woman recording data during a sampling trip to an effluent stream. Photo by Dave Walker. I’ve decided to put off talking about my damselfly research another month or two so the post is closer to the paper release date, so I’m going to talk about another subject today: aquatic insects and water quality. In my second year of grad school, a professor for a class I was taking recommended that I apply for a job. A month later, I had a second job in an aquatic ecology lab and was working as an aquatic sampler and insect identification guru. 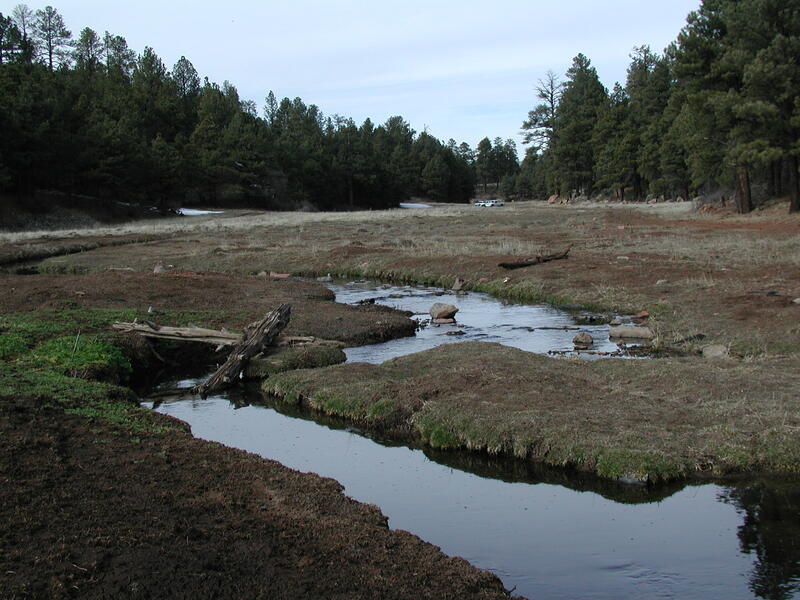 The project I was hired for originally was for the Environmental Protection Agency and focused on the impacts of effluent (treated wastewater) on the insect populations downstream of wastewater treatment plants in Arizona. I can’t say that sampling for the project was pleasant and I can attest to the fact that wearing chest waders in poorly treated, reeking wastewater when it is 110 degrees in the shade is quite awful. However, the project taught me firsthand just how much of an impact water quality has on aquatic insect populations and it is a subject I find fascinating. In fact, my work in my second job has helped direct my plans for my research program once I have completed my doctorate. I haven’t talked much about my second job yet in my blog and it’s time to rectify this! 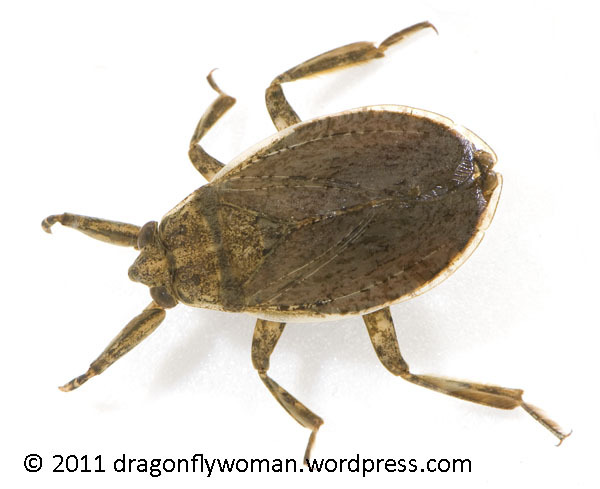 Today I’m going to introduce the subject of aquatic insects and water quality. Arizona has a lot of problems with its water. There are huge demands placed on the little water that is available and streams and rivers have been sucked dry by farmers and growing cities over the last hundred years. This means that in some sections of several rivers there would be no flow at all if it weren’t for wastewater treatment plants releasing effluent. So just how to insects respond to wastewater? The short answer is this: not well. 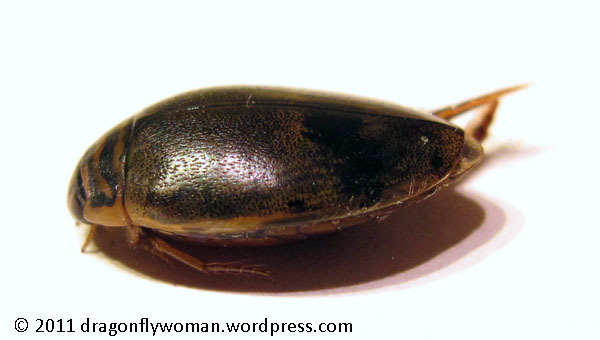 Aquatic insects are typically adapted to a particular range of conditions. If those conditions change, such as when effluent is dumped into a stream, the insects must often move to a different habitat or die. Other insects, things that are very tolerant to polluted waters, may move into the area in their place. You can therefore see a huge shift in the types of insects living in a clean, relatively pristine stream relative to an effluent dominated stream (a stream nearly completely or completely made up of effluent). Many types of insects simply can’t live in environments with low water quality – and those that can tell you a lot about how terrible the water quality really is. In fact, aquatic scientists often use aquatic insects as biological indicators of water quality. That was exactly what we were doing in the effluent project, using insects to tell us about the quality of water in effluent dominated streams. I’m not going to go into detail about that project today. Instead, I’ll illustrate the differences in the insect populations between two streams in the Tucson area, one effluent dominated stream (the Santa Cruz River) and one mostly clean water stream (Sabino Creek in Sabino Canyon) so you can see the shift from dirty water insect populations to clean water populations. Bloodworms, larvae of the non-biting midges (a type of fly). This photo made the front page of the newspaper the day the article ran! Ah, the lovely bloodworm. And notice that ALL of the insects in this image are bloodworms. Not all bloodworms are a sign of troubled waters so you can’t simply say that bloodworms = low water quality. However, if you find tons of bloodworms and nothing else in a stream, that’s usually a bad sign. Bloodworms get their name from their red coloration (it has been mostly broken down in the image due to the preservatives used – they’re flaming red when they’re alive) and that red coloration comes from a chemical bloodworms have that almost no other insects have: a hemoglobin-like compound. If you want to read more about bloodworms and their hemoglobin, please read my post on aquatic insect respiration. For now all you need to know is that the hemoglobin-like compound allows these insects to live in very low oxygen environments. Thus, the sheer abundance of these insects and the lack of other insect species tell you something important about this stream: there is hardly any oxygen in the water at least some of the time. The chemicals in the water probably contribute to the overall inhospitability of the river for insects as well. Thus, the insects in the stream tell you that this stream has poor water quality. We found this to be the case at all of the effluent streams we sampled during the EPA study, but this particular wastewater treatment plant had the fewest species of aquatic insects downstream of the plant of all of the streams we tested. Notice the difference between this stream and the effluent stream? Look at how many more species there are! And some of these, including the hellgrammite and the clubtail dragonfly, only live in pretty clean water and need a lot of oxygen. Even if you didn’t know that though, you could tell that this is a fairly clean water stream simply by looking at the number of insect species living in it. 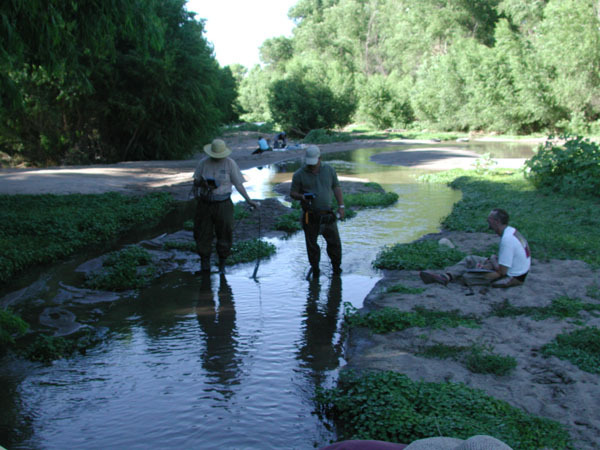 There is one caveat, however, when comparing the Santa Cruz River to Sabino Creek. 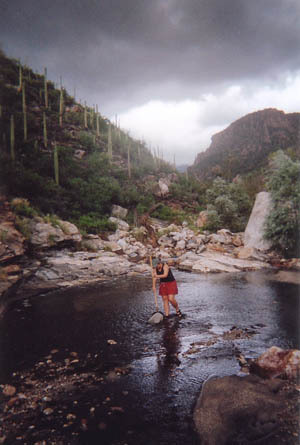 The river is in the Tucson valley and is located at a lower elevation than Sabino Creek, which means that the types of insects you find in the stream would likely be a bit different even if they had the same quality. Still, if you compare other effluent streams at similar elevations, or even the Santa Cruz River below the wastewater treatment plant upstream of Tucson at Nogales, it is obvious that the section of the Santa Cruz flowing through Tucson is really nasty. Sabino Creek is comparatively very clean. And, the insects in the stream can tell you just how clean the water is because they are excellent indicators of water quality. This trend, that clean water has much higher insect diversity than polluted water, seems to hold true throughout the world in the majority of aquatic habitats. For this reason, insects have become very important in water quality studies. By collecting insects and identifying them, a scientist can say some very profound things about the water quality in that environment even if he doesn’t take any other measurements. I’ve personally done a lot of work using insects as indicators of water quality through my second job and this work has profoundly impacted how I think about aquatic systems and the insects that call them home. I’ll definitely be revisiting the topic in the future. Well, I didn’t quite get this post done the day I meant to, but my day ended up being quite busy. However, the NABS/ASLO joint meeting of 2010 is now officially over! That means this will be my last NABS post until I go to another conference. It’s nice to be back home! Meetings are exhausting and melt your brain after a while. They’re fun, but they’re intense – and I never get enough sleep. No matter how much I enjoy a meeting, I’m always happy to get back home and sleep. And, if I come away from the experience without any new communicable diseases, I’ll consider it a success. I’m going to skip the Things I Leaned section for today and jump right into the last talk. Today, my focus is a talk by Dr. David Houghton that was given on Day 3 of the conference. Dr. Houghton is an entomologist and Associate Professor at Hillsdale College. Hillsdale is a small liberal arts college (even smaller than the one I went to as an undergrad!) and Dr. Houghton is in the department of biology there. Sadly, there aren’t all that many people from these sorts of schools at most of the meetings I go to. This is doubly sad because Dr. Houghton’s presentation was really interesting and made some excellent points. In the area in southern Michigan where Dr. Houghton completed his study, the streams used to be surrounded by a wide strip of dense vegetation (the riparian zone). The area is now an agricultural region. This means that, rather than large trees and plants that require a lot of water filling the space adjacent the streams, the native plants have been removed and the agricultural fields go right up to the banks. This has several implications. The lack of trees means the water is warmer than it was before the trees were removed because there isn’t as much shade on the water. A lot of chemicals such as pesticides and fertilizers end up in the water any time water flows over the fields and into the streams (i.e. during rains, heavy irrigation, etc). Those chemicals decrease the water quality, which in turn impacts the plants and animals that live in the water. Overall, the water quality decreases and with it the number of species that can live in the river. In general, this situation isn’t good for the stream or any of its biota. The river needs the forested areas for everything to work properly. Removing the riparian area means that things in the river change and the “health” of the river goes down. Stream health is a somewhat vague concept that I don’t want to get into here, but it is essentially a measure of how close to naturalistic conditions an ecosystem is. Dr. Houghton’s talk began with this introduction. Then he asked a question: are the small forested areas that are still available along southern Michigan’s streams capable of improving the water downstream so that the area downstream more closely resembles conditions without the influence of agriculture? This has important implications for conservation of aquatic species. Dr. Houghton’s study was conducted in the St. Joseph River in southern Michigan. Like other rivers in the region, the St. Joseph has agricultural fields along the majority of its length with small forested areas near the headwaters. In particular, Dr. Houghton was interested in one section of the river that had a small terrestrial preserve where the riparian area remained intact. The river running through the preserve looked better than the area upstream, so he thought the water flowing through the area might be improved such that insects downstream of the preserve would fare better than the insects above the preserve. To study this, Dr. Houghton chose six sites in the St. Joseph River from which he collected water and insect samples. Two sites were above the preserve, two were within the preserve, and two were further downstream. He measured several parameters of the water itself, including the temperature, dissolved oxygen, pH, and conductivity (effectively a measure of the amount of salt compounds in the water). He also measured the insect populations by collecting adult caddisflies at light traps near the river. Measuring the water parameters would tell him whether the water running through the preserve or downstream of the preserve was better than the water upstream of the preserve. Because caddisflies are aquatic as larvae and live in the water for most of their lives, they are strongly impacted by water quality and are excellent indicator species. Counting the number of individual adults and the number of species (also known as species richness) that came to the light traps would tell Dr. Houghton something about how “healthy” the river is. His results were interesting. There was no difference in any of the measurements of water quality Dr. Houghton collected above and below the preserve. This meant that the river is an agricultural stream for its entire length and the preserve did not improve the water quality downstream. There were two water parameters that improved within the preserve: the temperature (it went down) and the amount of dissolved oxygen (it went up). These two changes can likely both be attributed to the amount of shade the river receives in the preserve versus the areas outside. Shading the water causes the temperature to go down because less sun hits the water. This in turn causes the dissolved oxygen to go up because cooler water holds more oxygen than warmer water. However, once the water flowed back out of the preserve, the temperature and the dissolved oxygen went back to the levels seen above the preserve. The preserve did not appear to be improving the water quality in the river. Similar results were found using the insect samples. Dr. Houghton found that 7 species of caddisflies made up 90% of all of the specimens coming to the light traps both within and outside the preserve. These 7 species all feed in similar ways (they are collector-gatherers and they eat things that are floating in the water, like leaf particles and floating algae that are of the appropriate size) and have the same level of tolerance to pollution. So, it appears that the majority of the caddisflies in the river were about the same throughout, again suggesting that the preserve didn’t do much to improve the quality of the river. However, Dr. Houghton did detect one important difference between the caddisflies in the preserve compared to those outside: there were more species of caddisflies inside the preserve, so the species richness improved. 22 species of caddisflies were found only in area of the river where it flowed through the preserve. Most of these caddisflies fed in a similar way (they are shredders, or insects that tear leaves and algaes into pieces small enough to eat – an important component of decomposition in aquatic systems) and the remaining species were ones that required cooler waters than those found outside the preserve. None of these species were very abundant and in fact a few of them were represented by only a single specimen, but the species richness was definitely improved within the preserve compared to outside. Dr. Houghton ended his talk with a question: is the river “healthier” because of the presence of the preserve? He suggests that the answer to this question depends on what measure of health you are using. The preserve clearly didn’t change the water quality so that the section downstream of the preserve was different from the area above. 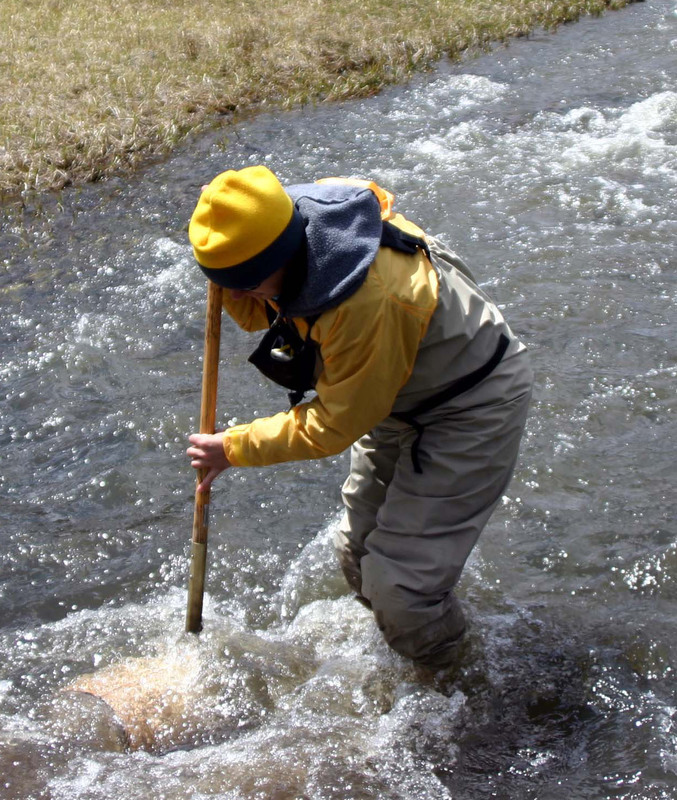 If your measure of river health is whether the water quality and caddisfly populations downstream of the preserve are better than those above, then the preserve does not have any effect. This could give some policy makers the idea that it’s okay to rip those last few preserves out, making space for more agricultural fields. However, if your measure of river health is species richness, the presence of the preserve had a huge impact. The river above and below the preserve had many fewer species of caddisflies than the area within the preserve. Clearly the preserve is acting as a refuge for species that are unable to live in the more harsh conditions outside of the preserve. Thus, if your goal is to maintain diversity in the stream, the preserve is very important. In fact, building new forested areas along the water might further improve the diversity of the river even further. I thought this talk was excellent. It was a simple project, but it did everything it needed to accomplish. Dr. Houghton’s talk also highlighted a couple of important points. First, when looking for the biological impacts of a system on a species, you need to identify which measurements of health you want to use. Second, it is good to consider multiple measurements of health within a system. It would be tragic for any study to say that forested areas near a stream aren’t necessary because they don’t improve the water quality downstream. I think what makes Dr. Houghton’s study great is the fact that he identified the changes in the species richness of the forested preserve, which showed that the preserve really did have an impact on the river system, if only in the area within the preserve. It wasn’t exactly the one he might have expected or hoped for, but it does suggest that forested preserves are valuable to river systems and should be protected so that species diversity within the river is maintained. And that wraps up the Notes from NABS series! I hope you all enjoyed the glimpse into the research that is currently happening in the aquatic sciences and learned some new things. Scientific conferences are an excellent place to gain new insights, think about things in new ways, or learn about things you’ve never even considered. Hopefully I have passed some of these qualities on as they’re just too good to keep to myself.